As the school year begins, a new batch of high school seniors typically set their sights on college. They start reviewing options, identifying costs, and preparing their applications for admission (if they haven’t done so already). When reviewing costs at each school, room and board is a common line item on the list, especially for students who plan to go to college away from home. But what is room and board exactly, and how much will it cost? If you and your student are unfamiliar with the term, here’s everything you need to know. 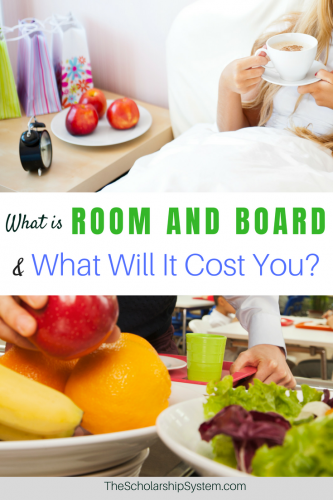 In its simplest form, room and board is a roof over your student’s head and food in their belly. If you prefer the dictionary definition, the answer to “what is room and board” is: lodging and food usually furnished for a set price or as part of wages. The “room” portion of the room and board definition usually relates to their housing, such as a college dorm room. It is where they will sleep, study, stream Netflix, and hang out with friends. Some colleges make living on-campus mandatory for students, especially if they aren’t local. This makes it easier for them to adapt to college life and makes sure they live near their school, eliminating problems like transportation issues that could hinder their ability to attend classes. However, just because the word “room” is used to describe the living arrangement, that doesn’t mean they get an entirely private space. Shared dorm rooms are still part of the room and board equation. On a good note, basic furniture is usually provided, though exactly what your student will have access to varies depending on their dorm room assignment and even the school they attend. Now that the “room” portion of the “what is room and board” question is covered, it’s time to address the “board” part. In most cases, “board” stands for your student’s meal plan. Many schools offer a few options, ranging from a set number of meals per day to unlimited access to the college’s dining room. The food and beverages are provided through cafeterias or similar dining facilities more often than not. This means your student doesn’t always have much control regarding what is available to eat or drink, but they are guaranteed to have access to food, based on their chosen meal plan. However, most colleges offer a range of options on any given day. Plus, many are respectful of potential dietary restrictions, providing at least one entrée that can suit various needs or preferences at each meal. Typically, a meal plan is a matter of convenience. If your child is hungry and has meals available that day, they can head down and get what they need without an additional cost. Some colleges do require that incoming freshman sign up for a meal plan if they also make living in a dorm room mandatory, so it’s important to keep that in mind. Now that you have an answer to the “what is room and board” question, it’s time to move on to the next part of the equation – the cost. The cost of room and board varies by school. However, if your student is heading away to college, it’s important to understand that it is usually substantial. On average, during the 2017-2018 school year, students spent $10,800 on room and board at public four-year institutions. At private nonprofit four-year colleges and universities, the average cost goes up to $12,210. That means, for in-state students at public four-year schools, the average cost of room and board actually exceeds the average price of tuition, which was listed at $9,970. However, some school’s charge notably more than the average amount for room and board. For example, the University of California – Berkeley charges about $16,398 for room and board. Yale comes in at around $16,000. On the other end, Northwestern Oklahoma State University charges $4,630 for a semi-private room and 12 meals per week. Often, the actual cost of room and board is somewhat variable. If a school offers multiple meal plan options, then your student may pay more or less than those estimates. Is Room and Board Cost-Effective? Whether paying for room and board is more cost-effective than living off-campus depends on a few factors. First, the area’s cost-of-living plays a big role, particularly when it comes to rental prices near your student’s college as well as food costs. In some cases, living off-campus may be more affordable, especially if your child splits these expenses with roommates. Second, it’s important to consider the convenience of these arrangements. Even if your student is paying more by living and eating on campus, certain hassles are automatically eliminated. For example, they don’t have to pay separate utility bills like electricity, water, garbage, and even internet is included with most dorm rooms and on-campus apartments. Additionally, if their meal plan provides them with enough meals every day, they don’t have to go to the grocery store or even cook, which can be a big timesaver. Plus, they don’t have to transport themselves too and from campus to meet their basic needs. Finally, depending on the school, paying for room and board might not be optional. If your student is required to live on-campus, then it’s simply an expense they will have to shoulder. Now that the question, “what is room and board and what will it cost,” is addressed, it’s important to understand that there are ways to make it more affordable. Similarly, opting for a meal plan that covers their needs, but maybe not their wants, can also help to lower the total amount spent. When staying on campus, the cost of room and board is included in the total bill through the university (compared to paying rent separately if living off campus). Typically, this means any overage money or loan money remaining after tuition and fees will be applied to the room and board balance. It’s is also possible to cover these costs without student loans. Of course, many families choose not to borrow for cost of living expenses like room and board, but instead try to use cash to pay for this part of the college experience. With flexible part-time jobs, students can help contribute to the cost. Even better, students can search for scholarship money to help cover the bill. Many scholarships allow students to direct their awards to handle a variety of school expenses, room and board included. This means your student might not have to come out of pocket to keep a roof over their head, the power on, and food in the belly. I personally received enough scholarship money to not only cover tuition, fees and books, but also my room and board (plus an overage check for extra expenses). So it is possible! By landing scholarships, your student can cover their room and board costs, ensuring they have everything they need to succeed in college.